Evergreen welcomed the incoming class of fall 2017 during new-student orientation. An inspiring fall quarter reminded us how the Evergreen community can move forward together, with open hearts and resolve, toward a bright future. As 2018 begins, new leaders invigorate our campus. You’ll meet two of them, Vice President and Provost for Academic Affairs Jennifer Drake and Vice Provost/Vice President for Equity and Inclusion Chassity Holliman-Douglas, in this issue. With their leadership, we will serve our students in new and profoundly important ways. This is a time when all of higher education is under great scrutiny and political pressure. This year, we will double-down on our commitment to teaching and learning the liberal arts and sciences in Evergreen’s unique way, which emphasizes context and creativity. We are deeply grateful for our alumni, whose optimism and faith in the promise of Evergreen buoys and sustains us. We are renewing our curriculum and improving student support. In the year ahead, we will reach out more boldly to prospective students about the strengths of an Evergreen education, explaining how our integrated academic programs and innovative faculty can prepare them to excel and lead in a complex, rapidly changing world. In this issue, you will meet Greeners who are using what they learned at Evergreen to transform natural, urban, and educational landscapes for the better. Poet-historian Emily Washines ’10 of the Yakama Nation is documenting the return of first foods, along with improved salmon runs along Toppenish Creek, a tributary to the Columbia River. Veteran Ray Mobley ‘15, relates a story from his military service in Iraq that reminds him of the importance of human dignity. Korbett Mosesly ’11, MPA ’17, helps guide one of the nation’s most effective NGOs, United Way, to support families in Tacoma’s urban Hilltop neighborhood. At Apple, Stuart Ralston ’06 gives tools and ideas to educators to make content relevant for students who can’t remember a time before smart phones or the Internet of Things. Greeners are inspired by complexity and stimulated by challenge. Our world is replete with both. 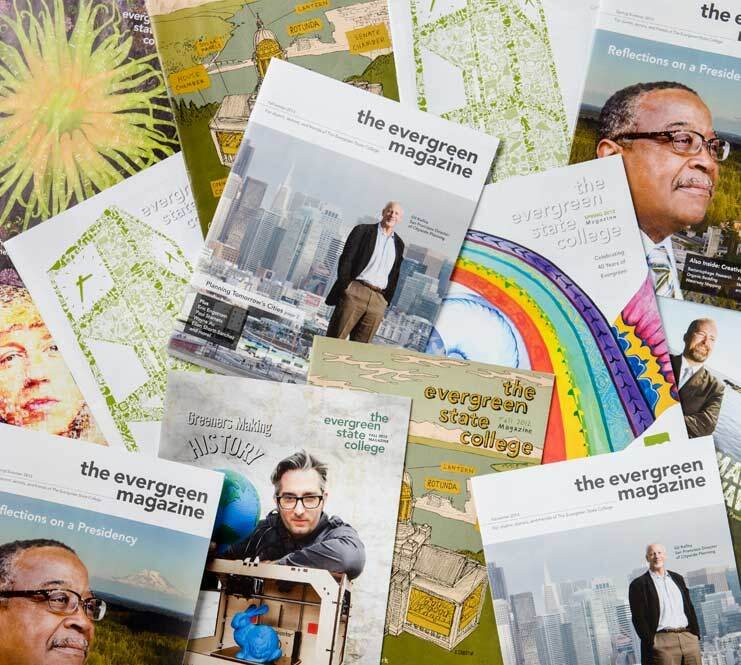 As Evergreen evolves, we are inventing new ways to enable our students to connect with and transform the world. I hope you will continue to aid this important work with your engagement, emails and calls, and contributions. Your encouragement and support form the foundation of Evergreen’s future.